Peter Long on Chess: Does The Current SCF Exco Take Pleasure In FIDE Suspending The ASEAN Chess Confederation? 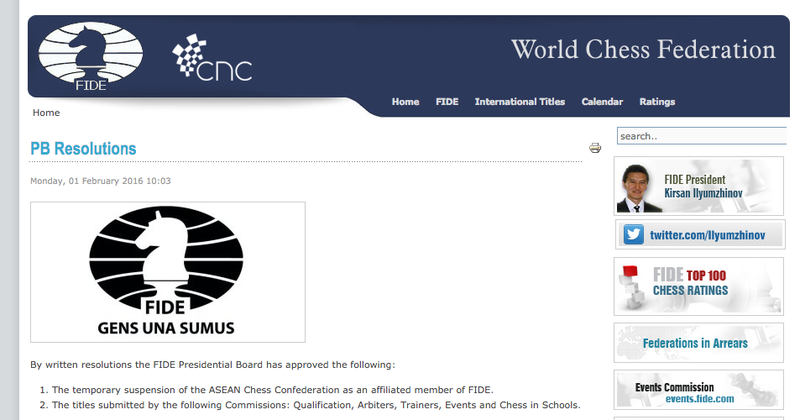 Does The Current SCF Exco Take Pleasure In FIDE Suspending The ASEAN Chess Confederation? I understand that it is the view of FIDE (World Chess Federation) that the ACC (ASEAN Chess Confederation) cannot act against SCF (Singapore Chess Federation). While FIDE seems to be arguing that due process was not followed by ACC and perhaps even that the penalty given to SCF was too harsh, SCF has effectively admitted to fault with a suspension of the individual named even if rather brief and also not officially communicated to either ACC or the complainant NCFP (National Chess Federation of the Philippines). Maybe I am wrong as do not have all the facts but as it stands I really do not see that FIDE has done much more than decide to take one side while making demands of the other (and more importantly without giving a reasonable time frame to act). My opinion as to who is right and wrong or what could have been done better is irrelevant in this fight - as I told FIDE, I am not a board member of ACC or a national chess federation delegate - but when I first heard of all this midway through the ASEAN Chess Championships, my concern, one that was indeed communicated to FIDE, was that whatever the politics were, the players should not suffer. 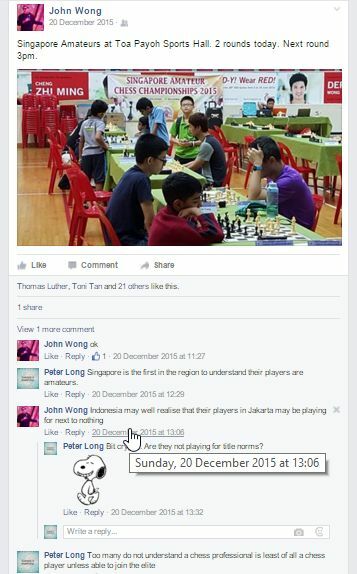 But now I understand what SCF Vice President John Wong was saying about the ASEAN Chess Championships in Indonesia which was about to start (when I commented on his post of 20 December on FaceBook). It seems clear that he (and almost certainly the rest of the SCF Exco) were aware or perhaps even part of FIDE's demand. What was that demand? Well, from what I was told, FIDE had written to the organisers on 17 December demanding that ACC lift SCF's suspension, failing with the ASEAN Chess Championships would not be recognised. ACC's reply was that they would be calling an ACC Board Meeting but it seems FIDE cannot wait. Firstly FIDE should understand that an individual cannot lift a suspension made by his board all by himself and secondly it was wrong and unreasonable to make that demand with penalties linked to an event about to start in some 4-5 days as two different things! I am glad FIDE has recognised that the ASEAN Chess Championships as a FIDE rated and titled tournament and I think FIDE should not take away the direct titles either. With the suspension of ACC, the ASEAN Age-Group Chess Championships which has done so much to grow chess in the region is now in disarray but the writing has been on the wall for some time now given that despite many requests by ACC to FIDE for months now to change the dates and venue on the FIDE Calendar (normally an administrative function), the event remains listed based on a decision made in 2014 notwithstanding having been changed many months ago! Of course it is not a secret anymore that FIDE General Secretary Abraham Tolentino wants badly to be ACC President. Singapore chess politics are of course for Singaporeans to resolve themselves but it seems the current Exco have FIDE backing and it is not just sad for Singapore chess but for its ASEAN neighbours when one of this SCF Exco takes public pleasure when secretly knowing that an event organised to help chessplayers in the region is not as everyone thinks. He likes it that organisers will have wasted effort, the sponsors thrown away their money, and the officials and players lost time and money to participate. This thinking I wish Singapore will keep for itself if that indeed is what Singapore chess wants. Malay Mail Online: Chess In Crisis In Singapore?